Heat coconut oil in a small sauce pan over medium low heat. Add ginger, ground turmeric, cinnamon, cardamom, and black pepper and stir, cooking spices until very fragrant, about 30 seconds to 1 minute. Scrape coconut oil and cooked spices into a high speed blender and add 1 tablespoon almond butter, vanilla extract, a pinch of sea salt and just boiled water. 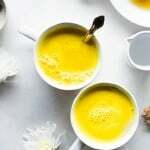 Blend on high until bright yellow, emulsified, and creamy! Enjoy immediately and say hello to a restful nights sleep.